Wanting to visit Zimbabwe then you are going to need to visa. Certain nationalities do not need a visa to visit Zimbabwe as tourists. 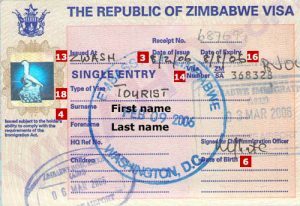 The Visa Upon Arrival in Zimbabwe for those traveling on tourism can stay for a maximum stay of 3 months. See the nationalities below. The visa fees vary from between USD $30.00 and USD $100.00 for the visa on arrival. Note however that these are only available at Harare (HRE) and Victoria Falls (VFA) International Airports. You will also have to hold a return/onward ticket or they will be refused entry to you. You can apply online for an e-Visa and it takes about 2 days to have it issued. You can apply for double entry as well as single entry tourist visas for Zimbabwe. Online you can also apply for a business visa or transit visa for Zimbabwe. If you are applying online then you will need to apply at least 3 weeks before you departure date. The visa is valid for 3 months from the date of issue. Search this website for your closet Zimbabwean Embassy in your country if you need assistance. a. Only Chinese tourists travelling as a group cleared by Tour Operators and Travel Agencies in the People’s Republic of China qualify. b. Chinese business persons and other citizens of the People’s Republic of China as approved by their Government need to apply for visas online.